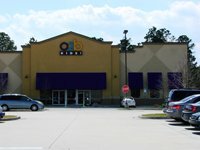 If you ever find you and your little ones near Fleming Island, or Gainesville, be sure to stop by and visit this amazing children's wonderland called O2B Kids! This magical place for kids ages 0-13, has so much to offer! It combines, daycare, VPK, Preschool classes, and also mommy and me programs all under one roof. Parents can sign up for an amazing array of kid friendly classes, such as gymnastics, theater, music, dance, karate, and more. Homeschoolers visit on Wednesdays and can play all day. Parents and kids can come on a drop in basis and play for only $8! The two outdoor play structures were very new, clean, and different, so much fun, and plenty of room for lots of kids to run around. The indoor spaces included in the parents and kids drop in rate, include, the computer lab, the playstation lab, the lego station, the pretend kitchen station, the dressup station, the reading station, the indoor "Big Toy" climbing station, and also the pretend rock wall, and more! They have a built in cafeteria that had very yummy things to eat and drink for moms and kids. This was quite a find, and an amazing adventure, and I recommend it, if you live close by, it's easy to become a member, or even if you have to travel quite a ways to get there, just get there! It is an awesome place for a very special day with you and your kids!